Bungie has just released a brand new trailer for Halo Reach to amp you up even further, as if you need further fuel. As the prequel to the Halo trilogy, Reach tells the story of humanities efforts to save the planet Reach from a Covenant invasion force. The trailer, called The Battle Begins, gives you a glimpse as to just what our group of Spartans are up against. There's a few campaign clues to be had in the trailer, including one which I might consider a spoiler. 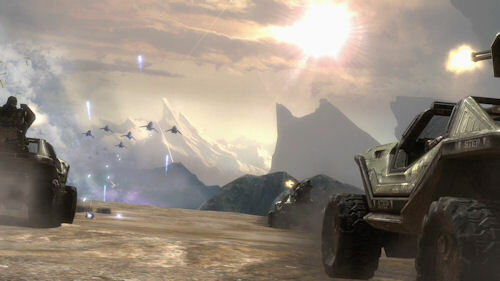 It does seem like Bungie wants to have some pretty epic battles, as pictured above, with huge numbers of vehicles going at it in open space. So give the trailer a watch, enjoy some new music from Marty O'Donnell, and start counting the days until September 14th with me. Page created in 0.2946 seconds.